Artists Comments: This subject was a particularly bold attempt for me as there were many elements to capture but it was these same elements that inspired me to paint that day. 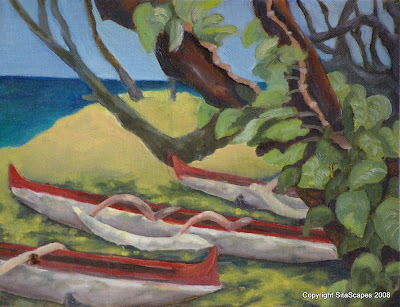 The tangle of vines crawling up a large tree trunk, heavily shadowed area, 3 canoes and a hillside basked in sunlight. Still not having understood the right combination of techniques to create believable shadows I reworked the shadows and sand area multiple times until I reached a point where I was comfortable with the result.